When you look at the different relationships in your life, you probably realize that some are going better than others. You might realize that some have become a little dysfunctional. You might realize that some are in a bad spot or in a bad patch. And it’s probably one or two relationships that you’d like to see blossom in a new way, really like to see them thrive at a new level. And sometimes it’s your best relationships that you want to see go to even another level. If you want to improve a relationship, one of the fastest and easiest ways to improve a relationship is to become a better listener. Every relationship improves when we really learn to listen in a deeper way, in a new way, in a fresh way. And that, of course, includes our relationship with God. But if you really, if there is really a particular relationship in your life that you would like to see thrive and blossom in a new way, really focus on how you’re listening to that person. Okay? Are you giving that person your full attention? You know? When you’re with that person, are you open to distractions and disruptions or do you put your phone away and block off distractions and disruptions so you can give that person your full attention? 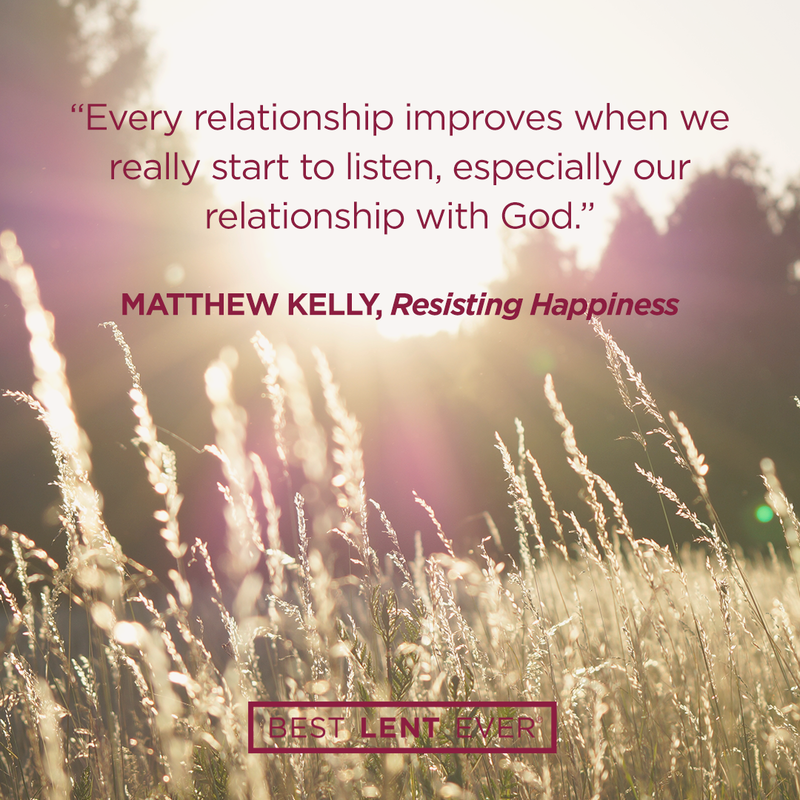 If we really do think about our listening, if we really do focus on our listening in a new way, I think that changes the way we experience Mass when we go to church on Sunday. We go to church on Sunday, I think very often it’s easy to fall into a passive state, and in a culture obsessed with entertainment, it’s easy to fall into a passive state that is completely disappointed from an entertainment perspective. That’s good. Because we don’t go to church on Sunday to be entertained. We do go to church on Sunday to listen to the voice of God in our lives. We do go to church on Sunday to receive Jesus Christ truly present in the Eucharist. And so our involvement in mass should be much more active, especially when it comes to listening. One of the things that has helped me become a great listener at Mass is the Mass Journal. I’ve been keeping a Mass Journal every Sunday for seventeen years now. I’ve got a whole shelf of Mass Journals in my study at home where I write and it’s an amazing source of inspiration. It’s amazing to go back and take off the shelf 2001 and look at the things that God was saying to me in 2001. It’s astounding to see how, you know, in 2001 I was making a huge deal about something and in it wasn’t a big deal. In fact it was never a big deal. I was making a big deal out of nothing. It’s interesting to go back and see, you know, the things I was really struggling with in 2001 and I’m not struggling with that thing anymore. You know? God’s grace has come into that part of my life and liberated me. But it’s also interesting to see, hey there are other things I was struggling with in 2001 and I’m still struggling with them today. And it shows that, that God’s voice in our lives is present, it is active, it is personal. God is deeply interested in personally communicating with us in a very powerful way. The question is are we listening? Next Sunday when you go to church, go to church as a proactive listener. I think you’ll be astounded at the messages God is delivering to us every singly Sunday of our lives. Make a conscious effort to listen to God and the people in your life. One way to do this is with Matthew’s suggestion of a Mass Journal. You can request one for free from Dynamic Catholic (just pay shipping). Lord, help me to listen to your voice at Mass. I know if I do, I will go out focused, energized, and invigorated. Today’s personal reflection features Dynamic Catholic team member Peter Garcia. Peter is our web administrator. He comes to us from San Diego, California. Peter enjoys painting and drawing, wants to travel to Japan, and delights the Dynamic Catholic team with his baking skills. How do you approach Mass?